Knights of Columbus 4556 - What's your most valuable asset?﻿ What do you consider to be your most valuable asset? When I ask that question of my clients, I get a variety of answers- "My home; my stock portfolio; my properties; my 401k; my brokerage account...." If you are still working, and you answered any of the above, I urge you to rethink your position. Your home is NOT your most valuable asset. (If there is a mortgage, it is actually a liability). In most cases, it is not your retirement account or your investment plan. Here's some food for thought- if you have more than 5-10 years until retirement, your most valuable asset is actually your ability to work and earn income. That's right! Let me repeat that: your most valuable asset is your ability to work and earn. It seems almost too simple, so many people overlook it, but let me ask you this: if you had an ATM machine in your garage- a machine that consistently and reliably pumped out cash to support your family's standard of living- how big of a priority would it be for you to insure that machine? A big priority, I bet!! Well if you have a job, then you too are the ATM machine for your family. Since May is Disability Income Awareness month, that leads me to the topic of this email- have you insured your most valuable asset? Is your income protected?? Too many people presume that they will have the ability to work for the next 10, or 20, or 30 years to earn the income they need to accomplish their financial goals- things like paying down their mortgage, paying off consumer debt, and contributing to their savings and 401k. Indeed, we as men many times (because of our egos?) feel like we're indestructible and untouchable. "It could never happen to me." But remember the words of our 1st Degree: Tempus Fugit, Memento Mori-"Time Flies, Remember Death." No one has a crystal ball. We don't know that God won't require our lives from us tonight. We don't know whether or not we'll be involved in an accident, or stricken with a terminal illness. Any of these predicaments would prevent us from working and earning an income to provide for our families and create the wonderful future that we all dream of. What will happen to your family if you incur a disability that prevents you from working? How much money do you have in the bank- enough to cover expenses for 1 month? 3 months? 6 months? In Orrin Woodward's book "The Financial Matrix", he discusses how only 59% of Americans have at least $500 in a savings account. (This is according to a 2014 study from GoBankingRates). 40% of Americans have no emergency fund! And many others are barely better off than that. With not enough money in the bank, where do people turn? They often tap into their 401k, their IRA, the brokerage accounts...the problem with that is with taxes and penalties, it can severely deplete a retirement account- and quickly! This is weighing heavy on my heart, Brother. Our staff has seen instances where just one year of a disability has eliminated a lifetime of savings, and significantly altered the standard of living for our families. One of the most disheartening things I've ever seen is when one uninsured, unexpected event wipes out decades of financial discipline. Don't let that be you! 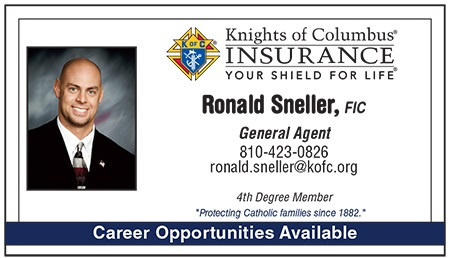 Let me introduce you to Income Armor, an individual disability insurance product from the Knights of Columbus. This should be a key part of your overall financial plan and family's protection. If you are ill or injured, Income Armor can provide tax-free monthly benefits to help you meet living expenses and maintain your family's standard of living. Your monthly benefits help you pay your mortgage and other monthly bills, while your savings and retirement assets remain intact. In short, if you have a job and don't have a way to protect that paycheck, you should seriously consider Income Armor today. As your professional insurance agent, risk management is my specialty. So reach out to me today, and let's find a time to get together to see how a "World's Most Ethical" company can help protect your income, retirement needs, and your family's financial future. VIVAT JESUS! What's your most valuable asset? What do you consider to be your most valuable asset? When I ask that question of my clients, I get a variety of answers- "My home; my stock portfolio; my properties; my 401k; my brokerage account...."
If you are still working, and you answered any of the above, I urge you to rethink your position. Your home is NOT your most valuable asset. (If there is a mortgage, it is actually a liability). In most cases, it is not your retirement account or your investment plan. Here's some food for thought- if you have more than 5-10 years until retirement, your most valuable asset is actually your ability to work and earn income. That's right! Let me repeat that: your most valuable asset is your ability to work and earn. It seems almost too simple, so many people overlook it, but let me ask you this: if you had an ATM machine in your garage- a machine that consistently and reliably pumped out cash to support your family's standard of living- how big of a priority would it be for you to insure that machine? A big priority, I bet!! Well if you have a job, then you too are the ATM machine for your family. Since May is Disability Income Awareness month, that leads me to the topic of this email- have you insured your most valuable asset? Is your income protected?? Too many people presume that they will have the ability to work for the next 10, or 20, or 30 years to earn the income they need to accomplish their financial goals- things like paying down their mortgage, paying off consumer debt, and contributing to their savings and 401k. Indeed, we as men many times (because of our egos?) feel like we're indestructible and untouchable. "It could never happen to me." But remember the words of our 1st Degree: Tempus Fugit, Memento Mori-"Time Flies, Remember Death." No one has a crystal ball. We don't know that God won't require our lives from us tonight. We don't know whether or not we'll be involved in an accident, or stricken with a terminal illness. Any of these predicaments would prevent us from working and earning an income to provide for our families and create the wonderful future that we all dream of. What will happen to your family if you incur a disability that prevents you from working? How much money do you have in the bank- enough to cover expenses for 1 month? 3 months? 6 months? In Orrin Woodward's book "The Financial Matrix", he discusses how only 59% of Americans have at least $500 in a savings account. (This is according to a 2014 study from GoBankingRates). 40% of Americans have no emergency fund! And many others are barely better off than that. With not enough money in the bank, where do people turn? They often tap into their 401k, their IRA, the brokerage accounts...the problem with that is with taxes and penalties, it can severely deplete a retirement account- and quickly! This is weighing heavy on my heart, Brother. Our staff has seen instances where just one year of a disability has eliminated a lifetime of savings, and significantly altered the standard of living for our families. One of the most disheartening things I've ever seen is when one uninsured, unexpected event wipes out decades of financial discipline. Don't let that be you! Let me introduce you to Income Armor, an individual disability insurance product from the Knights of Columbus. This should be a key part of your overall financial plan and family's protection. If you are ill or injured, Income Armor can provide tax-free monthly benefits to help you meet living expenses and maintain your family's standard of living. Your monthly benefits help you pay your mortgage and other monthly bills, while your savings and retirement assets remain intact. In short, if you have a job and don't have a way to protect that paycheck, you should seriously consider Income Armor today. As your professional insurance agent, risk management is my specialty. So reach out to me today, and let's find a time to get together to see how a "World's Most Ethical" company can help protect your income, retirement needs, and your family's financial future.